• Best Quarter in a Decade. U.S. stocks rallied last week, extending impressive gains for the first quarter, sending the benchmark S&P 500 Index to its best three-month start to a year since 1998, up 13.65%. The Dow Industrials gained over 200 points on Friday, boosted by favorable trade talk reports out of Beijing. U.S. trade officials said China had made proposals on a host of difficult issues, including its practice of forced technology transfer. • Weekly Performance. For the week, the S&P 500 gained 1.23%, the Dow Industrials advanced 1.67% and the tech-heavy Nasdaq Composite rose 1.15%. All three indices posted their strongest quarterly gains since the third quarter 2009. Week-over-week, the S&P 500 narrowed the gap from its September 2018 all-time high to 2.3% from 3.4%. • Key Economic Data. New home sales rose 4.9% last month, rebounding to its strongest pace in nearly a year, led by the Midwest region. Moreover, January’s originally reported a 6.9% sales decline was upwardly revised to an 8.2% gain. The median new home sales price fell 3.6% to $315,300. • Industrials Performed Best. Nine of the 11 major sectors posted weekly gains, led by Industrials (+2.88%), Materials (+2.11%) and Consumer Discretionary (+1.85%). Energy (+0.95) rose the least, while Utilities (-0.48%) and Communication Services (-0.48%) lagged. • Treasury Yields Weaken. Treasurys rallied again last week, sending the yield on 10-year notes down a net 3.5 basis points to end at 2.406%, a 15-month low. The U.S. Dollar Index strengthened by 0.65% last week, while West Texas crude oil rose by 1.86% to $60.14/barrel, its second $60 closing high this year. Friday, April 5: Nonfarm Payrolls, Unemployment Rate, Consumer Credit, Consumer Credit. The 10-year/3-month yield curve inverted for the first time since 2007. 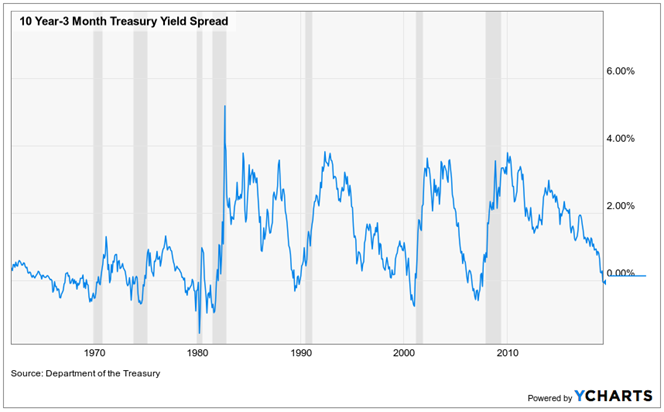 Historically, an inverted yield curve has been a reliable recession indicator, with an inversion between short-term and intermediate-term bonds preceding the previous 7 recessions. Keep in mind that the lead time has varied from 10 to 23 months ahead of a recession and equity returns have returned a positive return, on average, between the initial inversion of the yield curve and the start of a recession. At this time, the risk of a recession in the near-term is low in our view, but the trend in economic data has weakened in recent months.